My favorite shrubs are both low maintenance and multipurpose. They attract and provide nectar for bees and butterflies. They add color and texture to my yard. Some have a dreamy fragrance and some leave flowers in my puppy’s hair. Most of these flowering shrubs also attract hummingbirds when they are passing through. The flowers provide nectar for the birds. Your yard can be a pit-stop on their journey. prefers full sun, but will do quite well in partial sun. It may grow to 5 feet tall and wide depending on the conditions in your yard. It is easily trimmed to a manageable size for most any yard. It blooms profusely from early spring well into fall. Jatropha also has pink and red varieties. 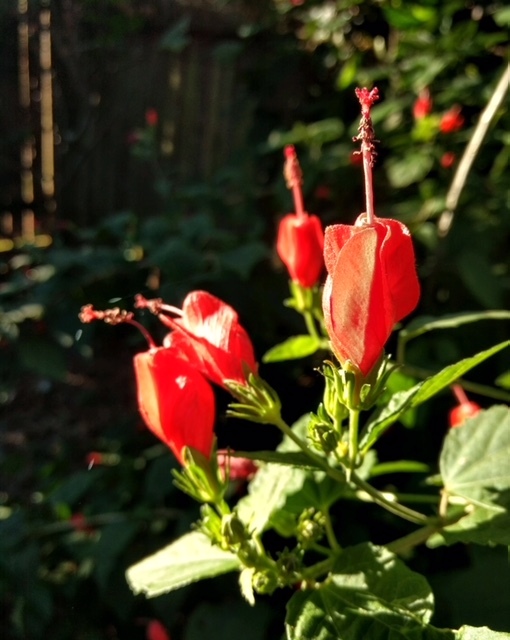 This shrub can grow to 5 feet tall but will stay more compact and grow more upward than outward. It will also bloom from early spring into the fall. Again, this shrub prefers full sun. My Mock Orange is a transplant from my mother’s yard. This woody shrub will have a brilliant show of flowers in May. It will be completely covered with white orange blossom flowers. It is also very fragrant. It may be trimmed to maintain a certain size, or if in a corner of your yard, it can grow to a large 6 feet tall and wide anchor shrub. Full sun is preferred, but it will still bloom with a little bit less than full sun. My Blue Plumbago is a small, hardy, profusely blooming shrub. It will grow to 4 feet tall and 4-5 feet wide. This sun-loving shrub can easily be trimmed to maintain a certain size. All of these shrubs are heat and drought tolerant once established. Of course, they do need occasional watering. 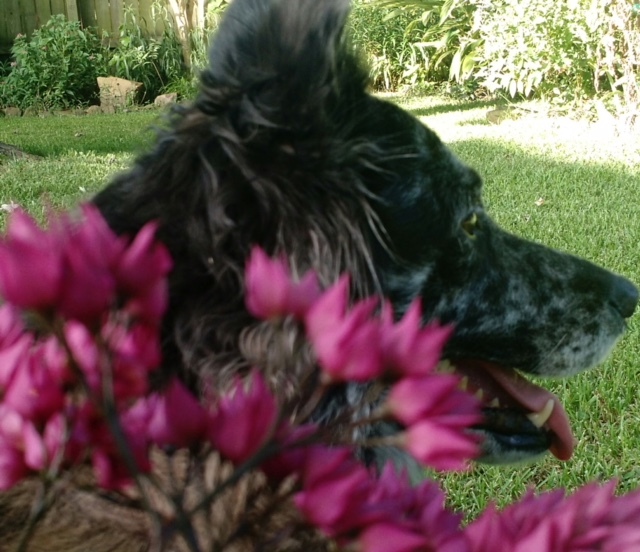 Shrubs can handle a lot of foot traffic and lots of dog interaction. I still get the beauty of a flower bed, but in a more upright position. I like to think of it as a dog safe upright garden. She still has the run of the yard, and my flowers are safe above ground. Everyone is happy… Good gardening!